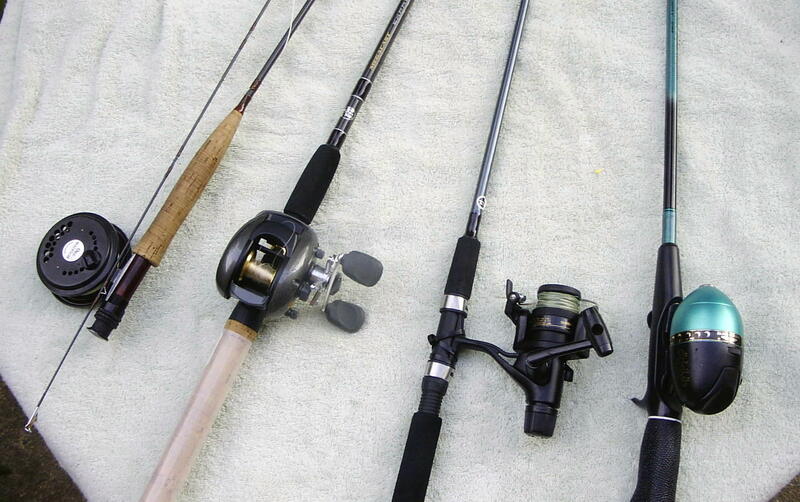 There are four basic types of reel, each matched to a type of rod, and type of lure. For example, the most extreme is probably the fly reel and rod, which is used for casting typically very light lures; rods of 8-12 feet are common. Baitcast are used by professional sports fishermen, probably because they have mastered the problems and complexity of the reel. First, there is a star wheel which adjusts how tight the line is, the drag. For example, if you have line that has been tested to snap at 8lbs of weight, and you have a 10lb fish, the line would snap. The drag allows line to be pulled from the reel. Spinning reels have the drag as a dial either on the top or bottom of the reel and are nowhere near as fidgety. The baitcast also has an anti-reverse dial, usually quite small, the size of a pea, that has to be adjusted each time the weight of the lure is changed. The dial should be set so that the bait has a very slow free fall when the thumb/clutch bar is pressed. Too tight and the bait won't cast, and too loose and you have the baitcast nightmare: the backspin or "birds nest". The more expensive the reel, the more likely there are anti-reverse weights that stop the line from feeding on itself. While some are set automatically or by a dial , unfortunately the most expensive require you to take the reel apart and adjust the weights by hand - which eats into fishing time. One reason the pros have multiple rods and reels, all set for different weights, strengths, distances. Spinning reels are spools that are vertical to the vertical rod. They can handle a greater range of weight and generally cast further than bait/cast rigs because there is so little friction; the line just unravels off the reel, which doesn't move. They are also the only type of reel that generally comes ambidextrous; you can change the handle from right to left-handed in seconds. Great for visiting fishermen, as you don't have to have extra left-handed reels. Finally, the spincast reel works very similarly to a spinning reel, but is enclosed, looking almost egg-shaped. It is virtually fool-proof and is generally a child's first rod. Because of its simplicity - a trigger lets the line flow out - it is great for casting often and far. Rods for spinning reels are recognised by large eyelets along the underside of the shaft, getting smaller as they approach the end. Baitcast reels generally have more eyelets but are smaller all along the top of the shaft. Since the spinning reel doesn't move on the cast, there is no backspin, removing a major time-consuming problem. The only awkward part of casting a spinning reel is that there is typically no thumb button to press, like the baitcast and spincast reels, making casting a two-handed affair: flick the bale up with one hand and hold the line with the index finger of the other hand to the rod. Shimano at one point had triggers on their FX series, which they no longer make. Cabelas has a line, and apparently there are other, smaller Shimano versions. Write me if you are having trouble finding one; definitely worth the advantage. Spinning reels are also vulnerable to a phenomenon known as line-twist, which means that the line will, in the extreme, wrap around itself. At some point the line has to be fully extended and respooled. Reeling with one hand and squeezing the line between the thumb and forefinger of the other, to give the line some resistance, will allow the line to rebalance itself on the spool. All reels also have a wind ratio to consider. For example a reel that says 5.1:1 would reel in, say 5" for every complete turn of the handle. 4.3:1 would reel in approximately 4" for each turn, on a reel with the maximum amount of line it can hold. The larger the number equals the faster the lure can be retrieved. This is good for baits that are to imitate speed, bad for baits that resemble food that moves slowly. First let's try to avoid a disaster. The purpose of drag, or release really, is to prevent you from reeling in when the weight would snap either your line or the rod. Not in the TV series, because you all bought spinning reels and put 30lb braid on them ...but a way to protect your rod and line. If you can pull line from the reel at the rod tip and it makes a whirring sound, then it is probably too loose; if you cannot pull it without effort, then it is too tight. The drag is set by a knob either on the top or bottom of the spinning reel. It is the "star" shaped wheel on baitcast reels. The rule of thumb is to set the drag at 1/3 the tensile strength of the line; for example, 30lb test should make a whirring sound when 10lbs of pull is applied. A good way to check, is to take a fish scale, attach it to the snap and pull, then check the weight/strength at the point at which it started to whir or for the line to come off the reel. In action, with a fish on the line, when you hear that whir, STOP reeling as that is going to put twist into the line! Let the fish do the work. Like bullfighting, let the fish tire itself before reeling in.